I’m getting to like Salsa more and more. Salsa is a popular side dish of Mexican cuisine, easier than making any kinds of salad. Tomatoes and peppers are often used as the main ingredients. As I’ve got a beautiful pineapple sitting on my kitchen bench top, so didn’t need a second thought. 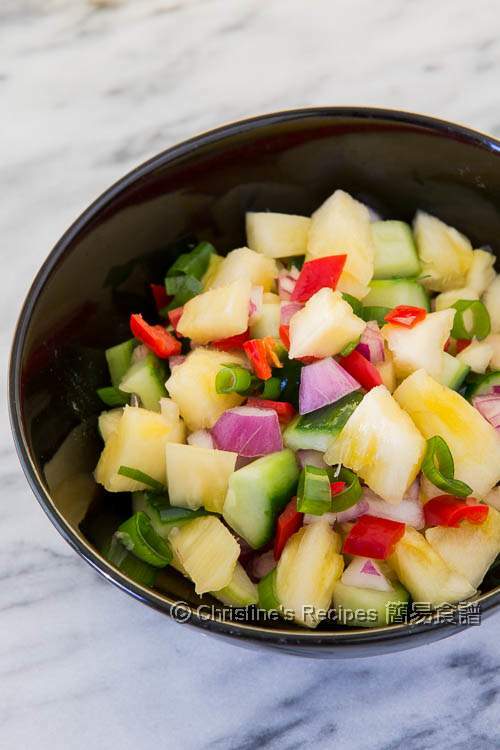 I used the pineapple and tossed with other ingredients to go with my grilled chicken. Its natural sweetness with a hint of tangy taste just worked so well to balance the meat, giving you a very refreshing feel. Besides, are you curious how my grilled chicken looks and tastes like? The recipe will follow soon. Soak the pineapple in salted water for 10 minutes. Drain well. Combine all ingredients in a mixing bowl. Refrigerate for about 1 hour, letting the flavours combine together before serving. It goes really well with grilled meats. Some people might feel itchy on their tongues after eating pineapples. 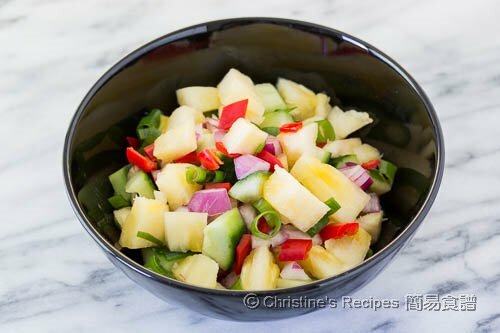 By soaking the pineapple in salted for a while, it will help decrease the itchy sensitivity. The amount of chilli can be adjusted to your liking. If you find it's not hot enough, you may add more chillies, or mix in the chilli with seeds. The taste of red onions is milder and sweeter than the brown ones, great for making salsa and salad.